Evans agreed to convert $3 million of his 2019 salary into a bonus, Field Yates of ESPN reports. Evans is looking forward to working under new head coach Bruce Arians next season, Herbie Teope of NFL.com reports. "I'm excited," Evans said. "I've heard nothing but good things about him. I'm sure he's going to be ready to work, and I am as well." 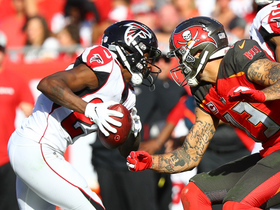 Evans brought in six of nine targets for 106 yards and two touchdowns in the Buccaneers' 34-32 loss to the Falcons on Sunday. 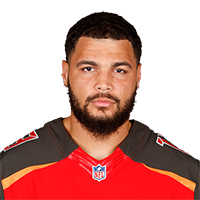 Evans brought in six of 10 targets for 90 yards with a touchdown in the Buccaneers' 27-20 loss to the Cowboys on Sunday. 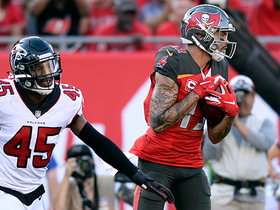 Analysis: Evans paced the Bucs in receiving yardage, hauling in a game-long 38-yard reception and also logging his first touchdown in the last five contests. The fifth-year pro now has one reception of over 30 yards in each of the last three games, posting yardage totals of between 86 and 121 in those contests. Evans has enjoyed a strong second half of the season overall despite some turmoil at the quarterback position, and he'll look to finish his campaign strong versus the Falcons in Week 17. 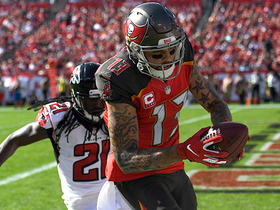 Evans brought in four of nine targets for 121 yards in the Buccaneers' 20-12 loss to the Ravens on Sunday. Analysis: The catch rate left something to be desired, but Evans managed a highly appealing stat line from a fantasy standpoint. Over half of his production came on a 64-yard reception on a broken play, which helped lead to his seventh 100-yard effort of the season. The 25-year-old was kept out of the end zone again, however, and he 's now gone four consecutive games without a touchdown. He'll look to build on Sunday's effort versus a stingy Cowboys secondary in Week 16. 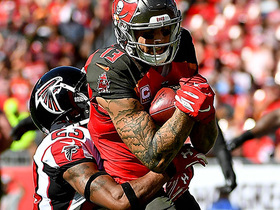 Evans brought in four of his six targets for 86 yards in the Buccaneers' 28-14 loss to the Saints on Sunday. Evans caught four of six targets for 48 yards during Sunday's 24-17 loss to the Panthers. 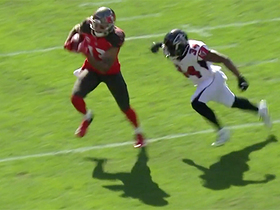 Evans brought in six of eight targets for 116 yards in the Buccaneers' 27-9 win over the 49ers on Sunday. 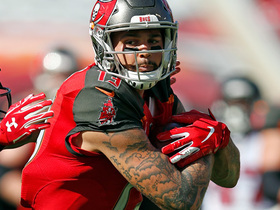 Evans brought in six of seven targets for 120 yards and a touchdown in the Buccaneers' 38-35 loss to the Giants on Sunday. He also recovered a Jameis Winston fumble in the end zone for a touchdown. Evans caught three of six passes for 51 yards during Sunday's 16-3 loss to Washington. Evans (knee) was a full practice participant Friday and doesn't have a designation on the final injury report for Sunday's game against Washington, Greg Auman of The Athletic reports. Evans (knee) turned in a limited practice Thursday, Greg Auman of The Athletic reports. 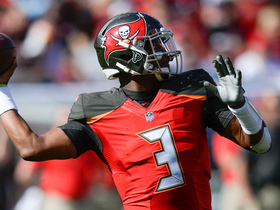 Evans (knee) returned to practice Thursday, Rick Stroud of the Tampa Bay Times reports. Analysis: Evans kicked off last week with no participation in the initial practice but built up to full by Friday's session. He seems to be doing the same this week, but his activity level Thursday won't be known until the Buccaneers release their second Week 10 injury report. Evans (knee) didn't practice Wednesday, Greg Auman of The Athletic reports. Analysis: Evans was also held out of practice last Wednesday, upgrading to limited participation Thursday and then a full session Friday. He went on to handle his usual workload in the 42-28 loss to Carolina over the weekend, but it's quite possible the knee injury contributed to a hideous stat line, as he finished with only one catch for 16 yards on 10 targets. It's only fair to expect a rebound Sunday against Washington, assuming Evans makes it back to practice Thursday and/or Friday. Evans brought in one of 10 targets for 16 yards in the Buccaneers' 42-28 loss to the Panthers on Sunday. Evans (knee) logged a full practice Friday and doesn't have an injury designation for Sunday's game at Carolina, Greg Auman of The Athletic reports. Analysis: There was some concern when Evans was held out of practice Wednesday, but he returned to a limited session Thursday and was unrestricted to close out the week. He'll catch passes this week from Ryan Fitzpatrick, who has been on the throwing end of each of Evans' four touchdowns this season. Evans (knee) practiced in a limited capacity Thursday, Jenna Laine of ESPN.com reports. Analysis: After he was seen limping near the end of the Buccaneers' Week 8 loss in Cincinnati, Evans has some work to do to gain clearance to play Sunday at Carolina. Friday's injury report could clarify as much, but there's a possibility he'll enter the weekend with a designation in tow. Evans (knee) returned to practice Thursday, Greg Auman of The Athletic reports. Analysis: Evans exploded for a season-best 179 yards on 13 targets (13.8 YPT) this past Sunday in Cincinnati, but he was seen limping off the field late in the fourth quarter. As the Buccaneers began Week 9 prep, the team revealed he was dealing with a knee injury on Wednesday's practice report. Progressing from no participation to some in the span of one day is a step in the right direction, but only a full session will clear up his health. 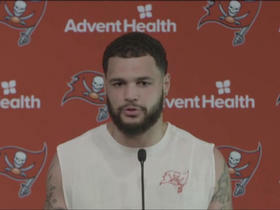 Tampa Bay Buccaneers wide receiver Mike Evans talks about the Buccaneers' talented offensive roster. 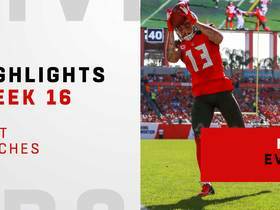 Watch the best catches from Tampa Bay Buccaneers' wide receiver Mike Evans during his 2018 season. 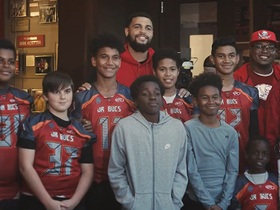 Tampa Bay Buccaneers wide receiver Mike Evans provides lasting Christmas memory for deserving Tampa Bay kids.